Does your property suffer from drainage issues? Do you have a very flat property? Maybe you have really dense soil? Or maybe the water table in your area is very high (close to the surface)? If your property has these issues, then a well designed and implemented drainage system should be a high priority for you. Without proper drainage in place your landscape and lawn areas can be prone to flooding, it can drown out expensive plants, erode away expensive hardscaping and even cause damage to structure and their foundations. Irreco LLC is a full service landscaping contractor based out of St. Louis, Missiouri. 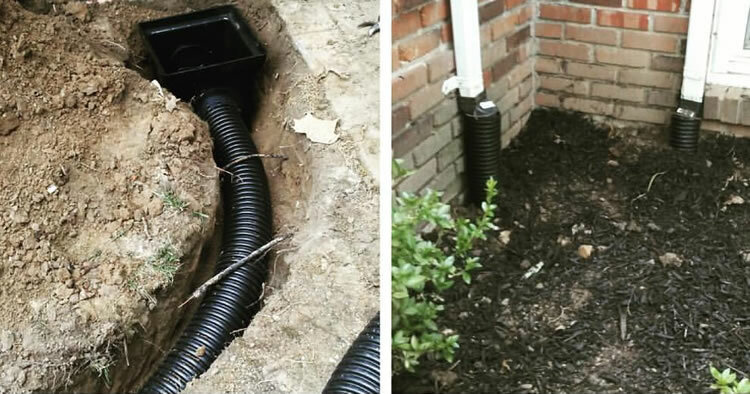 We specialize in drainage system installations and repairs. Many of our clients properties suffer from poor drainage or have drainage systems that just weren’t implemented correctly from the start which has led to significant erosion problems, soft spots, and flooding in their lawns and landscapes. Drainage issues should be addressed when the initial landscaping is completed and a good landscape designer will take the time to understand how water may flow from your property and they will also know and understand the rainfall in your area and/or how high the static water table is in your area. Armed with this knowledge drainage problems can be prevented before they start. Severe or sustained rainfall is often the catalyst that will expose drainage problems on any property. After a few days of rain on a property with poor drainage you’ll visibly see swampy areas or low spots that have standing water. Your property will essentially become “flooded” in a short period of time, if the water table is high in your area, then rainfall only makes the problem worse. How To Test Your Current Drainage? If you are unsure how to tell if your current drainage is performing as it should you can run this simple test. Choose an area of your property that might be in a low spot and dig a hole approximately two feet deep and 2 feet wide. Once the hole is dug, put your hose in it and fill it up with water. If the water drains away within an hour your drainage is very good. If you fill the hole with water and it takes 6- 12 hours to drain, then it’s a pretty good sign you may have drainage problems. If you fill the hole with water and it takes more than 24 hours to fully drain, then there is a major drainage problem that could contribute to damage on your property. If your property has lots of clay-based soil then you may have problems with surface water pooling up. Clay is very dense and doesn’t allow for good drainage. Surface water issues can often be solved by properly grading the property away from the home and into a swale that can channel the water away from your property or into an existing storm drain. One of the most popular drainage systems to install for a surface water problem is the French drain. This is a time-tested drainage solution that gathers water and channels it to a place underground (usually a trench filled with gravel) where the water can take its time percolating down through the dense clay soil. Hardpan or “Soil pan” as it’s sometimes called is a very dense layer of soil found below the topsoil layer. There are different types of hardpan but they all share the general characteristic of being a distinct soil layer that makes it very difficult for water to permeate and drain through. Some hardpan drainage problems are formed by deposits in the soil that bind the soil particles. Others are man-made problems, such as hardpan formed by compaction from heavy machine traffic. If your property is affected by a high water table (water that lies close to the soil surface) then low lying areas of your landscape can pose a real drainage challenge. Often the best solution for a high water table is to plant appropriate trees, shrubs, and other plants that are capable of handling very wet, boggy, conditions. These might be plantings that natively grow in riparian areas such as swamps or bogs. Another option is to raise the planting and garden areas up. You can do this by mounding up areas with additional soil and appropriate plantings to keep it held together or you can even used a raised garden bed strategy. These are expensive solutions with all of the labor and materials required by they are effective if your property suffers from a high water table. Break Up Hardpan Soil – If your property suffers from a hardpan soil problem (usually within the top 30 inches) it can be penetrated with a machine such as an excavator, skid-steer, or backhoe. This break ups the impermeable layer of soil and can help to improve drainage conditions. Regulate Your Irrigation System – Many irrigation systems are setup to deliver water to a lawn, garden, or landscape over a set period of time rather than on the needs of those specific plants. It’s a good idea to set your irrigation to meet the needs of your specific landscape rather than set it on a timed schedule. For example, if you’re irrigation system runs for an hour in the evening, but the plantings are sufficiently watered within 20 minutes, that extra 40 minutes of watering doesn’t make much sense and likely contributes to the drainage issues. Check For Broken Plumbing Or Sewer Lines – In some cases, poor drainage, or pooling, standing water can be the symptoms of a broken, clogged, or corroded sewer or drain line. The broken line causes the excess water to pool near the surface. If your drainage issues are accompanied by a foul sewage smell, then this could be part of your problem. Who Choose Irreco LLC To Solve Your Drainage Problems? When you choose to work with Irreco to solve your drainage problems you are partnering with a local company who has many years of experience identifying and solving drainage issues on our customers properties. Whether it’s some low-spots in your lawns, some garden beds that don’t seem to dry out, water threatening to undermine your foundation or hardscaping, we can help. Our team will take the time to assess your property and come up with a drainage solution that will solve your standing water issues once and for all. If you’d like to receive an estimate to solve your drainage issues please give us a call (314) 246-0099 or fill out our online contact form and we’ll get back to you shortly.